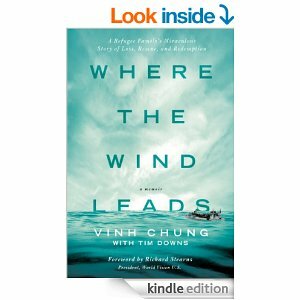 Where the Wind Leads is the story of a family forced out of Vietnam in the aftermath of the Vietnam war. The first part of the book chronicles the life they abandoned when they fled and their harrowing journey as unwanted “boat people” in desperate search of a place to land. Then the story shifts. They are welcomed to a small town in Arkansas, and face the challenge of learning an entirely new culture. This is an especially strong section, as the author does a great job of detailing small cultural differences and how they add up to make communication and integration unexpectedly difficult. Then my favorite part is where he shares about being a nerdy high school kid trying to connect with a girl he’s attracted to. These scenes are just so sweet and hapless, and they had me cheering for him and laughing at the same time. Also, they provide a nice balance to the intensity of the first part of the book. It was nice to see a child who almost didn’t survive wrestling with everyday questions about what to say to a girl. The back cover of this book calls it “a story of personal sacrifice, redemption, endurance against almost insurmountable odds, and what it truly means to be American.” Often, cover copy is hyperbole, but in this case the book more than delivers. I’m still thinking about this story days after turning the last page. Highly recommend. Disclosure: I received this book from the publisher in exchange for an honest review. This entry was posted in Book Recommendations and tagged Book Review, Where The Wind Leads on April 21, 2014 by Trish Ryan.